Your guide to understanding the different types of SSDs and their price points. When building a PC, the focus is generally speed and performance. Faster processor. Better graphics card. But what about your storage? Are you limiting your data transfer rate by using an older Hard Disk Drive (HDD) or a Solid State Drive (SSD) connected to an older, slower Serial ATA (SATA) interface? If so, don't worry — we're going to break down the latest on SSD storage solutions to help you stay up to speed (pun intended! ), while also guiding you to the best price to pay per gigabyte of storage. Special thanks to ADATA for inspiring this topic and providing us with various SSDs to try out! First, a bit of background: The Hard Disk Drive (HDD) has been the standard since the late 1980s and has the benefit of a lower cost and larger storage capacity, which is why many people still use them as a mass storage solution for photos, movies, etc. However, recent advancements in Solid State Drive (SSD) technology have been making the performance to cost ratio even better, and SSDs are quickly becoming the new storage standard for anyone building or upgrading a PC. A modern SSD has no moving parts, and instead uses NAND Flash technology with a semiconductor array of memory organized as a disk drive, similar to a USB flash drive. And while it's true that SSDs, by design, have a limit on how many times data can be written, most newer drives have estimated write limits of over 100 terabytes (TB), and will easily last over a decade with normal use. Unlike an HDD, which can only read/write data sequentially, an SSD can access data cells simultaneously, resulting in much faster speeds. Using an SSD can dramatically reduce loading times for tasks like gaming, video editing, or simply just running your computer's operating system. 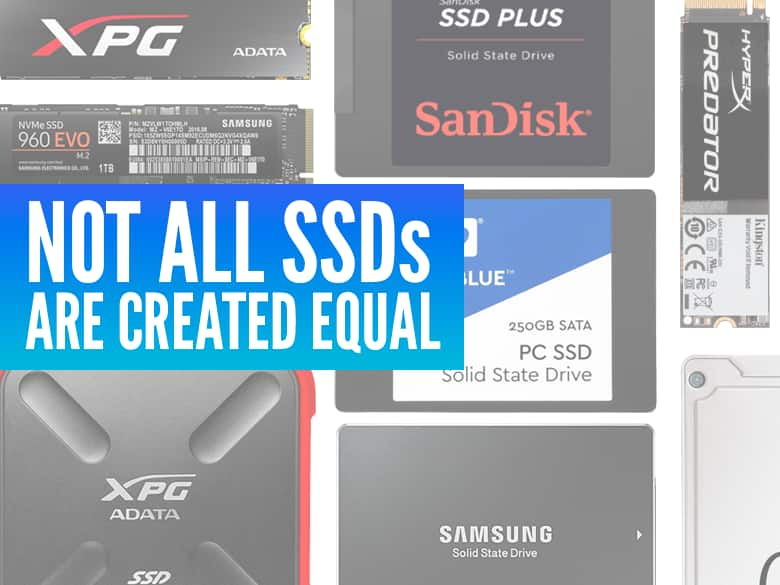 A Solid State Drive is a category, not a model, and there are several different SSDs that you'll want to be familiar with to decide which is right for your PC build. The most affordable type is a 2.5-inch SSD. The Samsung 850 EVO is one of the most popular 2.5-inch SSDs available, and the 500GB model can often be found under $150 on SlickDeals. But the main limitation for 2.5-inch drives is the SATA III connection (internal) or USB 2.0 connection (external) — even the latest SATA III standard can only transfer data at a maximum theoretical speed of 600 megabytes per second or MB/s (real-world speeds are a bit lower). Yes, this is much faster than traditional HDD technology — which has max theoretical speeds around 50 to 150 MB/s — but it's rather limiting when considering the true capability of SSD technology. New external SSDs from companies like ADATA, for example, connect through USB 3.1 or USB Type-C. These connections can allow for theoretical transfer rates up to 1.25 gigabytes per second (GB/s), depending on the device you're using. For internal SSDs, an even higher bandwidth technology is already in place on the latest generation of motherboards: "PCIe Gen3x4." This new type of connection has a maximum theoretical bandwidth of 3.94 GB/s, which is over six-times faster than a SATA III connection. When looking for SSDs on SlickDeals, you will see some identified with the term "NVMe." Without getting too technical, NVMe means that it is compatible with the blazing-fast PCIe Gen3x4 connection. This NVMe connection is found on an SDD with an M.2 form factor, which looks similar to a RAM module — rectangular and skinny. But beware, there are some M.2 form factor SSDs that still use the much slower SATA connection. Check the specs! Top of the line NVMe M.2 SSDs can read at speeds up to 3.5 GB/s and write up to 2.1 GB/s, making good use of the PCIe Gen3x4 bandwidth! Let's say you've found a handful of NVMe M.2 SSDs to compare. At that point, it's just about pricing, right? Actually, that's not entirely true. The physical storage architecture in SSDs, known as NAND flash, can come in a 2D or 3D design, which affects overall price. 3D NAND flash technology means higher capacities, better efficiency, more reliability, and a longer life-span than 2D NAND, but it's also more costly to manufacture due to its complexity. So if you see a price discrepancy between two seemingly similar SSDs from different manufacturers, check to see if the flash technology is 2D or 3D. Will the Price of SSDs Continue to Drop? Thankfully, the prices of SSDs in all forms have started to fall and move slightly closer to the cost of HDD storage. Limits in storage size for older 2D NAND flash technology is fading out as new 3D NAND flash technology has been developed with new 48-layer and even 64-layer chips. However, development could stall with a shortage of NAND flash coming in 2018. The manufacturing facilities for NAND flash have not expanded to keep up with the growth of the SSD market. This means that prices for SSDs will rise significantly over the next year until the handful of companies that make NAND flash can catch up with demand. For those of you looking to build a PC, now may be the best time to get your order in for the latest SSDs before we see a spike. Looking through historical SSD prices on Slickdeals, we're able to recommend a target price of 30 to 40 cents per gigabyte of storage. The all-time low prices on 2.5" SATA SSD storage from brands like ADATA or WD come in around $0.30/GB. Those looking for a deal on M.2 SSDs will pay a bit more, and should wait for a price that is just under $.40/GB, similar to this 1TB Samsung 960 EVO NVMe M.2 SSD for $365. Overall, Solid State Drives are a worthy investment regardless of what type you get — it's the best bang-for-the-buck performance upgrade you could give your PC. Be sure to keep an eye on the SlickDeals forums for discounted SSDs or set a deal alert.